I just got this photo from Beavertail's Facebook page. 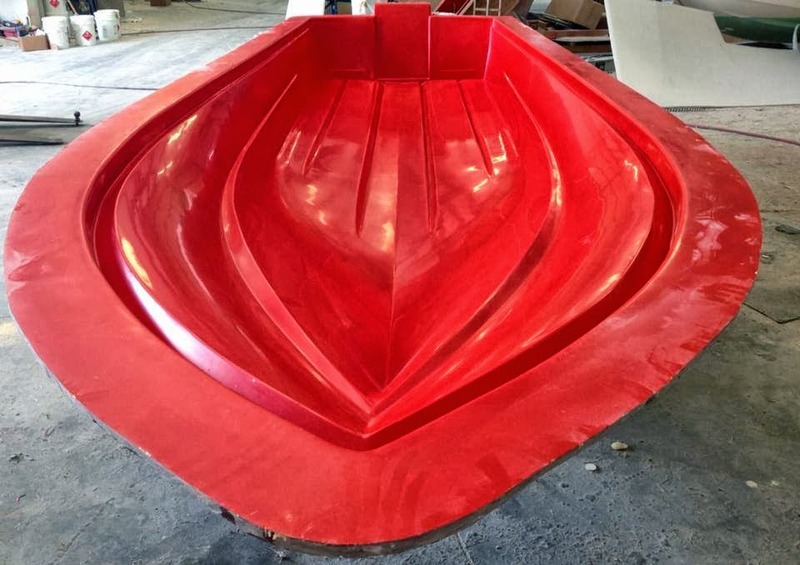 This is the mold for their newest skiff, the 2014 BT-Micro. It's currently in production and the first few will hit the water in about two weeks. I've already been on the prototype and it's an absolute blast. They haven't released the final numbers yet but at just over 16 feet in length, this is going to be one shallow running skiff. Here are a few more shots I took last week while fishing with Tim Reed from Idaho on the newest Beavertail Strike. The more time I spend on that boat, the more I fall in love with it. We ran and poled through several miles of backcountry creeks on a falling tide without ever once bumping the bottom, (or putting any scratches in the brand new gelcoat.) It was also just before sunset when these shots were taken and getting stuck way back in the mangroves at dark never once crossed my mind. That's nothing short of a death sentence this time of year thanks to the no-see-ums and mosquitoes. The snook bite has been better than I expected but we're not bringing in too many keepers. Most of the fish I've landed this month have been in the 20 to 24 inch range like the one in the above photo. These guys are a blast on an 8-weight rod and beautifully colored thanks to our dark water. This one hit an all white deer-hair streamer. You can't go wrong with patterns like that for snook under the mangroves. And remember, if you're not bouncing every other cast off the branches, you're not getting close enough. Brian Favara from New Jersey with a fat 20" trout caught north of Matlacha. While the redfishing has been really great in both Matlacha Pass and Pine Island Sound all month, the sea trout have been no-shows on a lot of my trips lately. That changed for me this morning when the trout started hitting Zara Spooks almost immediately. My anglers only brought a pair on legal fish back to the dock but the bite stayed steady all morning. We were fishing the Indian Fields just north of Matlacha and for the first time in several weeks the water actually tasted salty up there. We're supposed to get another pile of rain over the next few days but I'm keeping my fingers crossed that the salinity won't drop back to zero once again. At least the redfish aren't affected either way. Idaho angler Tim Reed came down to test out the new Beavertail Strike and chase some redfish with his fly rod at the same time. Mission accomplished. Some shots from last weekend. Here are some of the fish that local angler Len Favara caught with me yesterday afternoon during the last hour and a half of the falling tide. We were off Little Pine Island in Matlacha Pass where the water is still very brown and almost completely fresh. And just like I've been saying here for the past few weeks, the fish still don't seem to mind one bit. The mullet are absolutely everywhere when the tide bottoms out and the redfish are schooling up right along with them. The two reds in those photos, one was 27" and the other 28", were both part of a big school of at least 100 other fish, tailing like crazy and eating everything in their path. They ate white Gulp jerk shads as soon as they hit the water, and so did the trout. The jack smashed a Zara Spook even before it hit the surface and pulled so hard we were convinced it was an oversized red. Before all this happened Len spent over an hour casting to rolling tarpon in the exact same water. If anyone is telling you that all of the fresh water we're getting is ruining the fishing, please show them this post. Here's some photos I took of Capt. Luke Williams from Ft. Myers Beach on his new 2014 Beavertail Strike Elite. This skiff has an all Kevlar hull with carbon fiber hatches and poling platform deck making it even lighter than the standard resin hulled Strike. The Elite package starts in the low $30k range for the boat, motor and trailer. That's an absolute steal for what is easily the best flats boat on the market right now. Stop by this weekend's NMMA Tampa Boat Show to see the entire Beavertail lineup.